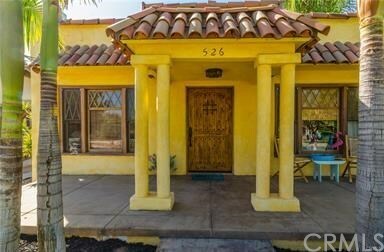 Spanish Mediterranean Home, Located in the Heart of Corona's Historic District. Unique Tropical Paradise!!! This Home Features Thousands in Upgrades!!! Flagstone Path Leads to Large Custom Front Door with a Wicket. Living Room Features, Custom Faux Paint, Stone Cast Fireplace, Distressed Hardwood Flooring. Dining Room has the Original Built in Cabinet restored to the original wood. Crown Molding, Custom Lighting, Curved Doorways. Gourmet Kitchen with Upgraded Cabinets, with Pull Outs, Glass doors. Large Island/Breakfast Bar, with Granite counter top. Upgraded "Kitchen Aid" Appliances. Built in trash compactor, convection oven, refrigerator, and more.. The Bath room has a Claw Foot Iron Tub, Custom Vanity with Brass Sink, and Tile Floor. The Casita, offers separate guest quarters, (is also the 3rd Bedroom, and 2nd Bathroom), and has been remodeled with Porcelain tile floor, New Bath Tub, Toilet and Pedestal Sink. It has it's own water heater, wall a/c and room heater in the fan. Extensive Electrical throughout, Lighting, and Sound System. Natural Stone Path leads to a "Top of the Line" above Ground Spa, tucked in a Private Palapa area, with Lighting and Sound System. Built in BBQ Island, with Natural Stone Tile, Palapa cover, built in Refrigerator, and sink.. The Outdoor Fireplace has a Large Hearth for seating. The Back Yard Living Space features Boulder Style Stamped Concrete, Custom Fountain, Patio Cover, Exotic Landscaping with Palms and Plants. Custom Gates and Carport. Directions: West Grand Bl to West 11th St West.